May is a beautiful month for anyone who loves nature. Flowers are blooming, birds are singing, bees are buzzing and there is greenery everywhere and in a myriad of shades to adore. I have a fantastic view of my front yard down to our pond from my office chair and I can count at least six different shades of green. It was hard to narrow down a particular shade, but after scanning my photos, I chose Fern Green as my May color of the month. 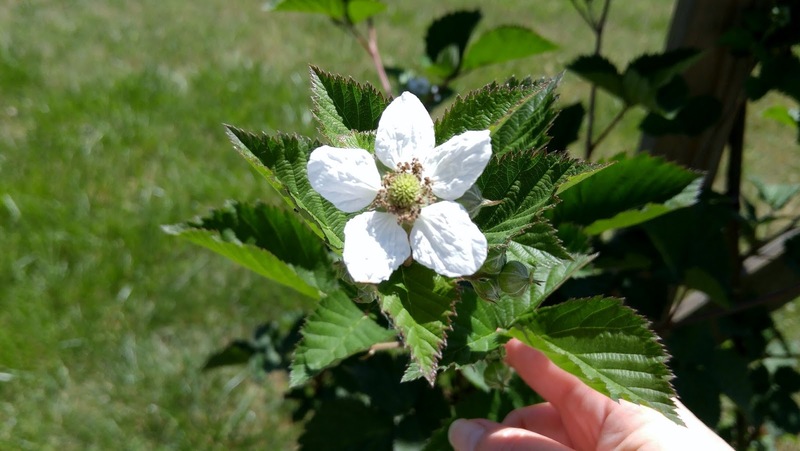 This photo of my Blackberry bush with the pretty leaves and white bloom was my inspiration for this months color choice. While I love flowers and blooms, it was the leaves in all their perfection I liked most. Here is my monthly Pinterest collaboration board I've put together to show you how to use, wear, and accessorize with Fern Green. I hope you enjoy it! Are we pin buddies? Follow me and comment here with your user name so I can follow you and if you have a cool pin that would fit in with this months theme, be sure to let me know in comments and I'll add it to the board. I plan on spending as much time as possible outside with my family this weekend enjoying all the pretty greenery. I hope your weekend is filled with all the things that make you happy. Please share in comments: What is your favorite pin from this months Pinterest board? I think I like your blackberry bush with the lovely flower best! You chose a great color for this month. After the winter, it's so nice to see green again. Thank you! I thought my nature loving friends might like the photo. Green of spring is always such a welcome sight after winter indeed!